In case you have been sailing endless circles in the Southern Ocean, you might not have noticed that social media has hit a wall. Most everyone I know is leaving it, or severely cutting back from this digital opioid. It seems only a matter of time before Facebook is a ghost town, collapsed under the sheer weight of its content, lack of oversight, and ill-designed algorithms. The company lost 19 percent of its value in a single day last week, over 100 billions dollars, the biggest loss in stock market history. It continues to lose both subscribers and business customers, all disgusted with its many flawed business practices and restrictions that defy the logic that initially drew us in. It was a brilliant idea, but its time may have passed. The problem, of course, is that what drives it also makes it unworkable, and that is content. Subscribers are bombarded with content they did not ask to see, and ads for products and services that may or may not even be legitimate. A waterproof drone for $99 to the first 200 people, so hurry! Efforts to reduce this also removed postings from one's friends, the very reason many joined in the first place. But the bigger picture of the Internet is also an issue. Undated, outdated, unverified, and misinformed content is a big problem, cluttering every search engine, not to mention the unfortunate rise of intentionally twisted misinformation designed to confuse and mislead opinions with false understanding. And just yesterday, Facebook officials acknowledged that coordinated campaigns to disrupt and sway political elections are now in this medium. And try to abolish any form of immigration control in this country. Another incident earlier this year is a perfect example of the dangers that can be used to promote one's agenda. Prince William stands by a car door showing three fingers in the air as a father of three. It was also shot from another angle at the same precise moment. That perspective appears to show him flipping off the crowd with his middle finger, the other fingers hidden from the side view. Just imagine what biased, anti-Crown news media could spin with that! I have three weather apps on my smartphone. Yesterday morning I checked and each offered a different forecast. The BoatUS app alerted me to a small craft advisory from 11 am to 6 pm, with gusts to 33 knots. AccuWeather said it was going to rain starting in 20 minutes, on and off all day. WeatherBug showed us facing a cloudy day with no rain. I rechecked and all discussed today's weather, not last week. So it is no surprise that I want a better source of information than what is currently floating out there on the Cloud and social media. If I want someone’s opinion, when I have no idea who they are or what they know, what value do I place on what they say? That is my biggest gripe with Facebook. And the person asking the question is often the problem to begin with. Why bother asking for opinions if you already know what you were going to do, or are not sharing enough information to solicit anything of value? How about this lame question seen on one of the FB groups: Hi guys, just wondering what length sailing (monohull) boat would you recommend for sailing on the British coast but also for longer trips like going to France and Spain (with multiple stops on the hook and moored at a harbour), many thanks. You can just envision the worthless exchange that followed. And my most hated post of all time: Single versus twins. Discuss. Anyone really interested in this would work with an experienced boat broker, or several, until they finds one who connects with them on some level. What are you looking for, what is your experience, how many people, what is your timeframe and budget? This informational quandary leads me to ponder where I should expect to get information in the future. Our need for reliable and valid information remains a critical element of the human experience, but how we get it certainly has changed in the past couple of decades. Who reads newspapers anymore, and who believes anything they see or read from news organizations, with identity politics and all? Magazines still exist but are struggling to remain relevant. The digital revolution has struck a critical blow to print publications, advertising, and readership. We consume information digitally, for the most part, and sadly, a significant number of people get everything they know from social media. I suspect the answer to this exists, or at least is ready to emerge. Niche publications are the only print publications doing okay, and herein lies the key. Niche user groups in social media may have tried to serve that purpose, but they fail miserably in my opinion. Only a fool would rely on such groups to answer important questions and issues. To move forward, we are going to have to go back in time, and that is not a bad thing. Maybe the needed expertise, advice, and support should come locally. I am lucky to live in Annapolis, the sailing capital of this country. So I prefer technical engine questions directed away from social media and towards my local diesel engine repair and service company. I trust what Barret Hill of Bay Shore Marine has to say about the belt dust I see on the front of my Volvo-Penta gas engine. I know him and trust his judgement. Maybe I should become more familiar with my local canvas and rigging shops to find solutions to how best to create removable windows in my boat’s enclosure or add an inner forestay. And keep them in business. There may be a hundred solutions out there if I look globally, but I’d be happy with just one that works near home. Maybe I’ll Google less and have more face-to-face. That is how we used to do it, person to person. Visit your local chandlery instead of Amazon. Ask questions in person, for a more human experience. Along the way you'll learn stuff you didn't know, and maybe develop new relationships. 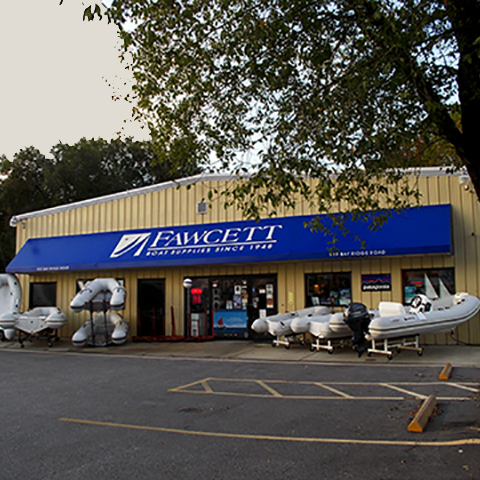 Local marine stores like Fawcett Boat Supply in Annapolis have knowledgeable people who can help you solve a problem. Let's keep them in business. I firmly believe in the value of the Internet, but instead of popping questions into the Facebook rabbit hole, why not see what focused and managed sites have to say. Is the Dismal Swamp ready for cruisers this fall? Anything I need to know to transit there in a month? I suggest asking that question within a niche website for cruisers by cruisers, such as Cruiser's Net (https://cruisersnet.net/). Become familiar with cruising websites like this one as it is managed by people committed to know the answers, find the answers, and share the answers. They offer a good deal more oversight than just watching for political rants. The result is credible information you can trust. That I believe is the future of information. Niche groups with a commitment to accuracy add value. Such programs are sustainable, as they attract advertisers wanting to spend their ad dollars wisely to serve a niche community, and it is a win-win. Much like PassageMaker Magazine was a niche information platform to bring everyone together about the boats, the people, and the trawler lifestyle. If I want to know the current danger of debris on Chesapeake Bay after they opened the Conowingo Dam on the Susquehanna River due to recent storms, I have options other than social media. Again, using Cruiser's Net as an example of a resource I'm familiar with, I can email one of the people there and ask about the status. No doubt they will know or make a point of finding out by contacting the correct resource or government department because the folks are connected and know this debris will impact hundreds of cruisers on Bay waters. Then they will share that information. It becomes a valuable resource for cruisers, serving the purpose of a social media group but, most importantly, under watchful management to keep it accurate, credible, and relevant. Do you see how that is markedly different from social media? Annapolis City Dock (aka Ego Alley), full of debris from the Conowingo Dam lock opening. Out in the Bay, boaters must thread through hazardous debris fields of trees, tires, truck liners, and furniture. One would think they could filter this crap out but the flow of water went through the spill gates at more than 300,000 cubic feet per second. A mess for sure. If you are planning to do the Great Loop, there is another excellent resource to replace one's need to wander the Cloud. The America's Great Loop Cruisers' Association (https://aglca.clubexpress.com/) has what every cruiser needs to know about this 6,000 mile adventure. Members who join the organization have access to all kinds of helpful information and tips, routes, and other resources. From what I've seen, the information they maintain gets regular updates from people doing the route, so remains current. I'm sure there are other groups and organizations for your cruising needs and areas. The social media Kool-Aid went down smoothly enough, but as awesome as it seemed in the beginning, it got too big with no one minding the store. If there are gems in the haystack, you would never even know. Time to move on. And from what I read, I am clearly not alone.